Will Senior Salon Services replace our current, well-liked stylists? We understand that certain stylists have long-standing relationships with their facilities, and make every effort to retain them while enhancing the quality of service. 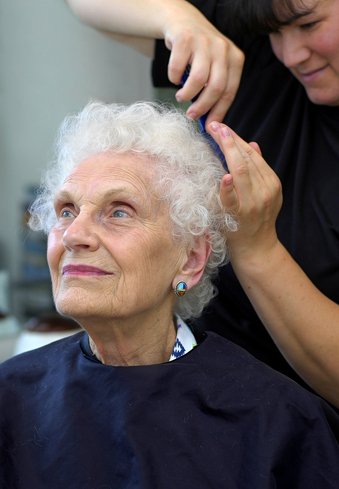 Will Senior Salon Services increase salon prices to our residents? Our representatives will survey your salon, discuss resident needs and review current charges. We can often accept current pricing, and if adjustments are needed we will suggest fair increases. Why switch to Senior Salon Services? Senior Salon Service’s professional, hands-on salon management team can save you time and money while reducing administrative tasks. We are a resident-focused, quality-driven company and our goal is to provide fair pricing and effortless service to your residents. Compare us to your current salon management and we will surpass your expectations. There is no cost to your facility, and we’ll even show you how to make your salon a proﬁt center!